I’ve been meaning to post about the Sleepout 4 Schools event run by the Yr 9 students of Toorak College for the last week, but time keeps running away from me. It’s vitally important that I give it the space it deserves; the students involved worked tirelessly and pulled off a marvellous day to support girl’s education in Kenya and India. The idea began with a whole day activity where the girls were exposed to ideas about how they could make a difference. They found out about the Bal Ashram in India and their plans to build a girl’s school to help save girl’s from child slavery. They also listened to Mark Lukach when he skyped in from San Francisco and told us about Daraja Academy, a girl’s school in Kenya started by Jason and Jenni Doherty that had just opened its doors two weeks before. That day sowed the seed and ideas germinated. A meeting of 30 or so interested students saw them decide on the idea to hold a sleepover at school as a fundraiser for the two schools. After quite a few weeks of planning the event was held on May 22nd. During the day the girls participated in a Global march into Mt.Eliza to raise awareness about the plight of children forced into child slavery. A neighbouring school, Mt.Eliza Secondary College, joined them and lunchtime shoppers and proprietors of our local shopping centre listened to the girls’ message. It was very well received and the girls felt like they had made an impact. At 6.00pm the sleepover began. As teachers, we’d been given a running sheet from the girls in the organising committee, but we fully expected that we’d have to step in to get things going. We couldn’t have been more wrong. They were supremely organised. All of the girls, all 54 of them, had paid to sleep over. During the night they raised money by selling popcorn and lollies and a group of them made friendship bracelets that they sold. Some of them had sought sponsorship from family members and friends to collect after the event. At 11.00pm we skyped Mark Lukach in and he talked about the progress of Daraja Academy. He was pretty #stoked (you have to know Mark on Twitter to get that one!) that 54 students had gone to the effort of getting together to do something good for others. Jason Doherty, the founder of Daraja was the next to skype in. This was Jason’s first ever skype call so it was pretty exciting. He was able to give us a lot of detail about Daraja and how the girls there are faring. Jason extended an invitation to our girls to visit the Academy; who knows, maybe one day we will get there. Jabiz Raisdana then skyped in from Qatar to let us know he was impressed with the effort of our students. It helped to let the girls appreciate the global nature of what it is they are doing. It was after 12 midnight by the time we’d finished our calls so you can imagine it took a bit of time to settle to sleep. We were up and at ’em by 7.00am the next day. We still have to get a final total of how much money was raised, but it should be close to the $1,000 dollar mark. Last Monday two of our students visited a local radio station and spoke eloquently and passionately about what they’ve been doing. We are very proud of the efforts of these Yr 9 students. They have a genuine sense of the importance of service unto others, of thinking outside yourself. That’s an important part of being human as far as I’m concerned and school communities can be instrumental in helping our young people to understand this. These students have also gained an understanding of their role as global citizens. They have used technology to connect with the people they want to help; we can’t get to Kenya direct yet but we are hoping to start to write to the girls over there. The girls created a Ning to support the project because they wanted to reach out to others to try and gather support. We didn’t quite manage that, but there’s always next year! Nice work girls. We’re very proud of you all. 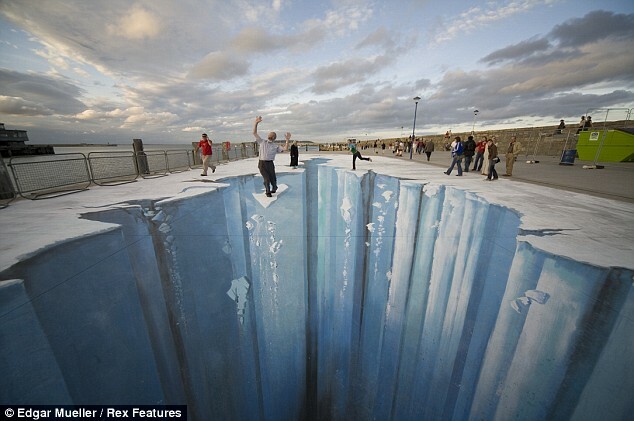 He spent five days, working 12 hours a day, to create the 250 square metre image of the crevasse, which, viewed from the correct angle, appears to be 3D. He then persuaded passers-by to complete the illusion by pretending the gaping hole was real. ‘I wanted to play with positives and negatives to encourage people to think twice about everything they see,’ he said. 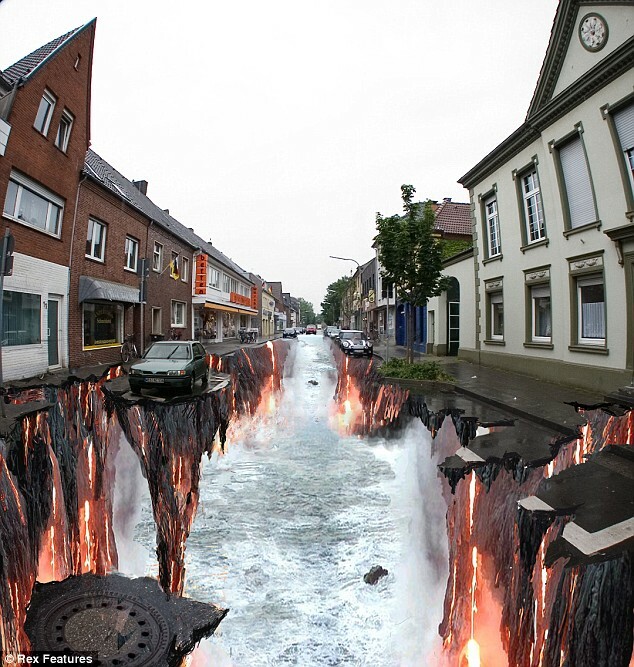 ‘It was a very scary scene, but when people saw it they had great fun playing on it and pretending to fall into the earth. What incredible creativity. I love work like this; something that makes you stop in your tracks and marvel at what human beings are capable of achieving. So go forth and embark on doing something remarkable this weekend. That’d be nice wouldn’t it. Maybe getting my house clean will be my remarkable feat, but I don’t know if I’m capable of achieving such a complex act! The Wilhelm Scream – movies will never be the same! Alec Couras has written a really useful post ’80+ videos for Tech. and Media Literacy’. And it is really useful so you MUST follow the link. He has pulled together an amazing array of links to videos and has catergorised them just to make the list even more useful. Alec makes mention of a plan to transfer the list to a wiki – a very good idea, but I’d understand if it doesn’t happen; he seems a very busy man. Perhaps it could become a collaborative effort as all wikis should be! The Wilhelm Scream is one of the videos I’ve stumbled upon thanks to this list. I love it; can’t wait to see another George Lucas film to lie in wait for the scream’s appearance. I’m going to upload it to our Yr 9 Ning because I’m pretty sure my students are going to get a kick out of it too. It ‘s something that I think is bound to promote some fun, connective conversation. It reminds me of the way Stephen Spielberg used the same sound effect in his first movie Duel and his mega hit Jaws. The dying moments of both films see the end of the beasts terrorising man, a semi trailer in one instance and a white pointer shark in the other. I can’t find a video on YouTube that captures both moments for a side by side comparison, but the video below captures the final scene from Duel with the music from the final scene from Jaws. Don’t feel sorry for me knowing seemingly unimportant information like this. I’m a hit at trivia nights, truly I am. I like this representation of peoples’ contributions to social technology and how you would catergorise those contributions. It appeared on Michael Stephen’s Tame the Web site and was posted on Twitter by Judy O’Connell. *update: Elaine Talbert had also posted a link in reference to this on Twitter this afternoon. You can find the blog post here. Its origins began with Charlene Li and Josh Bernoff, who have written a book called called Groundswell; winning in a world transformed by social technologies, aimed at companies who should be looking at how they can use social technologies to sell product. It makes me think. There are many of us in the edublogosphere who have harnessed how to use these technologies. I suspect there are many in the world of ‘work’ who have no idea. Yes, it’s Saturday. I’m late to the mark with this one. Last night I was sleeping out at school with our Yr 9 students raising money for Daraja Academy and the Bal Ashram in India. I’ll write about the wonderful experience that it was tomorrow. In the meantime, The Chasers (who’ve been off our screens for too long) can entertain you with the Citizen infringement officer evaluating hairstyles found on our streets. My daughter was introduced to The Chasers tonight and we spent a very pleasant hour together chuckling away. Enjoy the rest of your weekend. I’m going to try and catch up on a bit of sleep! What a nice surprise greeeted me via Skype this morning. Angela Stockman sent me the link to the above newspaper article about her daughter Laura and Working together 2 make a difference. It was written by Sarah Hanson, a freshman at Alden High who is a member of the site. Sarah has captured the motivation of the site very well in her article and I want to thank her for identifying it as something worthy of sharing with a wider audience. My students are going to be thrilled to see some of their comments highlighted in the article. Mike Fisher created a Wordle of the article and noted that it captured the intentions of the site really well in its representation. I couldn’t agree more. If there is something that I hope is lasting from my foray into this online world, then I hope it is Working together 2 make a difference. I like the space; it is welcoming, supportive and has good intentions. If you haven’t been there, please visit and consider joining. You’ll find there passionate educators who have a desire to impart the value of service learning to their students. Thank you Sarah for giving Working together 2 make a difference a profile that’s a little higher than what it had yesterday. It is very much appreciated. Robert Pattinson = no effect! Not here anyway. A little while ago, I wrote a post about how our school library blog has seen an influx of traffic directly related to a post written about Robert Pattinson of Twilight fame. My theory at the time was that the title of the post must have drawn traffic and I was wondering how writing a post with his name in the title would effect my blog stats. The day of posting saw a rise in stats, but that was because the post was picked up by stumbleupon. After that, no significant rise in stats could be directly related to that post. In the meantime, the Robert Pattinson effect has continued to generate consistantly high numbers to 2rak info 4 u. I’m assuming that somehow the Library post has been picked up by search engines and consistant traffic is finding its way there. Meanwhile, I wrote another post recently about Zac Efron and Leonard Whiting and the uncanny resemblance between the two. The numbers aren’t huge, but it’s interesting seeing in the stats the search terms people are using that lead them to this blog. It seems that there are a fair few people out there who have made the same connection. All very interesting really. Blogging is its own science, and I really don’t want to get to a stage whereby I’m dependent on the latest and greatest next big thing to generate traffic. It takes away somewhat from the intentions of this space really. I’d prefer that it gets read because people find the content interesting and useful. In saying that, I don’t relish the thought of the numbers drying up! Too much effort really to have that happen. While I’m here, can I share with you a totally unrelated but nonetheless interesting thing that happened today. I love Prada perfume. It’s hugely expensive, but memorable. Nearly every time I wear it someone makes a comment about how nice it is. A staff member came into the library late last year and said ‘Patchouli oil!’ He could smell it and said it took him back to when he was 17 when all of the girls wore it. I told him I was wearing Prada perfume. He sniffed my wrist and said ‘That’s it- Patchouli oil!”. Prada Perfume For Women is inspired by the past, that embodies the future. Prada Perfume For Women is a fragrance that intertwines memory, reality, and possibility. Pretty spot on with my colleague’s theory really. What’s really interesting is just how fast you can access information now. A conversation leads to a search, that reveals within minutes the data we were speculating about. Think back to 10 years ago; just how long would it have taken me to source this information? Another thought to ponder. How unhappy must Prada be knowing that consumers can find this out so easily? Now, to source me some of that Patchouli oil. Gotta be cheaper than $120.00 per 80ml.